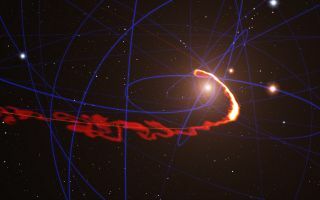 This fascinating space wallpaper shows a simulation of a gas cloud passing close to the supermassive black hole at the center of the galaxy in mid-2013. This fascinating space wallpaper shows a simulation of a gas cloud passing close to the supermassive black hole at the center of the galaxy in mid-2013. Observations with ESO’s Very Large Telescope confirm that the cloud is now so stretched that the front part of it has passed the closest point and is travelling away from the black hole at more than 10 million km/h, whilst the tail is still falling toward it.